Facebook unveiled a “Donate Now” button today to make it much easier for non-profits to take contributions. A nice side effect for its business? The button will collect credit card numbers and other billing info for Facebook that could aid its ecommerce and gaming initiatives. 19 non-profit launch partners will start displaying the Donate Now button at the tops of their Facebook Pages and bottom of their News Feed posts. These include DonorsChoose.org (a personal favorite), Boys And Girls Club Of America, World Wildlife Fund, UNICEF, Red Cross, and Kiva. After some more testing, Facebook will open the feature to additional non-profits, who can sign up for access here. Thanks to the Donate Now button, instead of forcing users off Facebook and away from their friends, these organizations can now accept donations in a pop-up window right on Facebook. Users can choose how much they want to give and either enter payment details or use ones already stored with Facebook. The pop-up could boost conversion rates and get more funds to needy projects. The Donate Now button also gives people an easy way to share the call for donations with friends, helping philanthropy go viral. Facebook is not charging a fee to process credit card donations and is instead paying that fee itself so 100% of donations go to the non-profits. Sadly, some people believe that corporations are all evil and there’s no way they could actually be staffed by decent human beings that want to help non-profits. But Facebook seems genuinely determined to help these causes, even if there’s no denying that the button could also aid its business. It’s a part of a trend of for-profit businesses launching philanthropy initiatives that could earn them money in the long run. Facebook backs Internet.org, an internet accessibility project for the developing world that could also get more people signed up for its social network. And just this morning, Comcast announced multi-million dollar backing for online education resource Khan Academy in hopes of attracting more low-income families to its reduced-price broadband service. Facebook is behind in the race to collect credit card numbers compared to app store owners like Apple and Google, and ecommerce juggernauts like Amazon. Not having payment details on file creates a barrier to people buying virtual goods in Facebook Games, or buying Facebook Gift cards for friends. The moral imperative to donate to a worthy cause could get users over the hump to keying in their credit card number or connecting another billing service like PayPal. 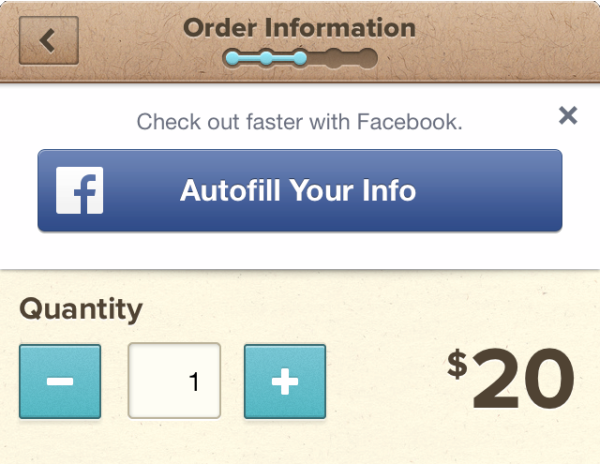 More payment info on file will also bolster Facebook’s latest ecommerce push: Autofill With Facebook. The system lets third-party mobile apps integrate a button in the checkout flow that lets users quickly pull in their billing and shipping info from Facebook without much typing. Facebook doesn’t collect a fee or revenue share, but instead plans to use purchase data it peeks on through Autofill to prove the return on investment of its ads. If you click an ad to download JackThreads’ ecommerce app, use Autofill With Facebook to import your payment info that you previously entered through the Donate Now button, and make a purchase, Facebook can tell advertisers just how much money their marketing message earned them. Again, these indirect boosts to Facebook’s business provided by Donate Now might not have been what drove Facebook to build the button, but they’re a convenient synergy. Connecting people to their friends and non-profits just so happens to make it easier to connect them to advertisers as well.